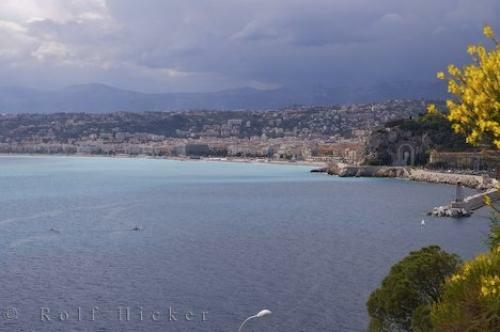 Clouds linger above the hillsides in the city of Nice on the French Riviera, but the hues of blue, shading the Mediterranean Sea, still show the beauty surrounding one of the world's most populated vacation resorts. Photo of the beautiful waterfront of Nice along the French Riviera, one of the vacation resorts attracting thousands of people. ... Parts of the city of Nice in Provence, France feature many examples of 17th century architecture making it an exceptional vacation place for history buffs.People who have visited the resorts or spent time along the French Riviera, talk about Nice for years to come and many will return to this destination every year for a dream vacation. The Nice-Cote d'Azur airport is close by and many tourists who come to the French Riviera do so via the waterways as there is a large marina close to the resorts which allows luxury yachts the pleasure of mooring while enjoying their vacation.Dreams of travelling to the French Riviera can become a reality and once you have visited Nice, you will fully understand why people make it their first vacation choice.Nice Waterfront, Provence, Riviera, Cote d'Azur, France, Europe. I photographed this photo with the digital SLR camera model Canon EOS-1Ds Mark II, aperture of f/5.6, exposure time of 1/400 sec. on ISO 100, as always I used a original Canon Lens, the focus lenght for this picture was 70mm.